Editor's Note: This is the second of a two-part series by the authors. To read the first post, click here. In the focus groups we conducted earlier this year—detailed in first of this two-part blog post—we asked area residents if they knew what other Texans thought about the Trans-Pecos area of the greater Big Bend region of West Texas. Do Texans think about it at all? Do they care about it? Most participants didn’t have an answer. To complement the Trans-Pecos focus groups, and to answer those and other questions, we conducted a statewide survey of 1,000 Texas registered voters plus two hundred interviews with people living in the Trans-Pecos region. 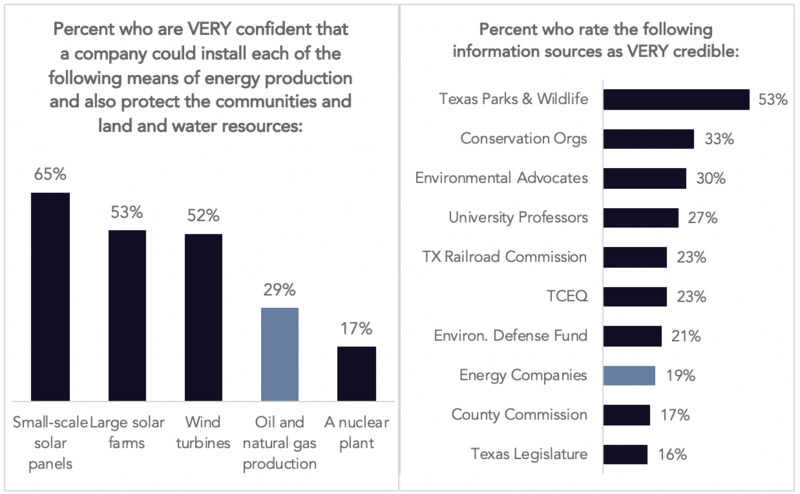 We found that Texas voters think energy development is good for the state’s economy, but they have concerns about where and how it takes place. While not surprising, there are significant partisan differences in the type of energy development Texans support. Republicans are somewhat more likely to favor oil and gas development, while Democrats overwhelmingly prefer wind and solar energy development. When asked why they thought development is good for the state, nearly all survey participants, regardless of party, pointed to job creation or support for the Texas economy. When asked to choose, most Texans prioritized protecting communities and land and water resources for future generations (56 percent) over energy development. Less than a third (30 percent) said they think the benefits of energy development outweigh those protections. Reflecting this view, more than half (52 percent) of those who participated in the survey opposed oil and gas exploration and production in their own local communities. Even more opposed development in some of the unique sites in the Trans-Pecos region, such as Big Bend National Park (70 percent were opposed), the Davis Mountains and the McDonald Observatory (63 percent) and the San Solomon springs at Balmorhea (54 percent). As we discussed in the first of this two-part series, this is an area where energy development is starting to evolve. 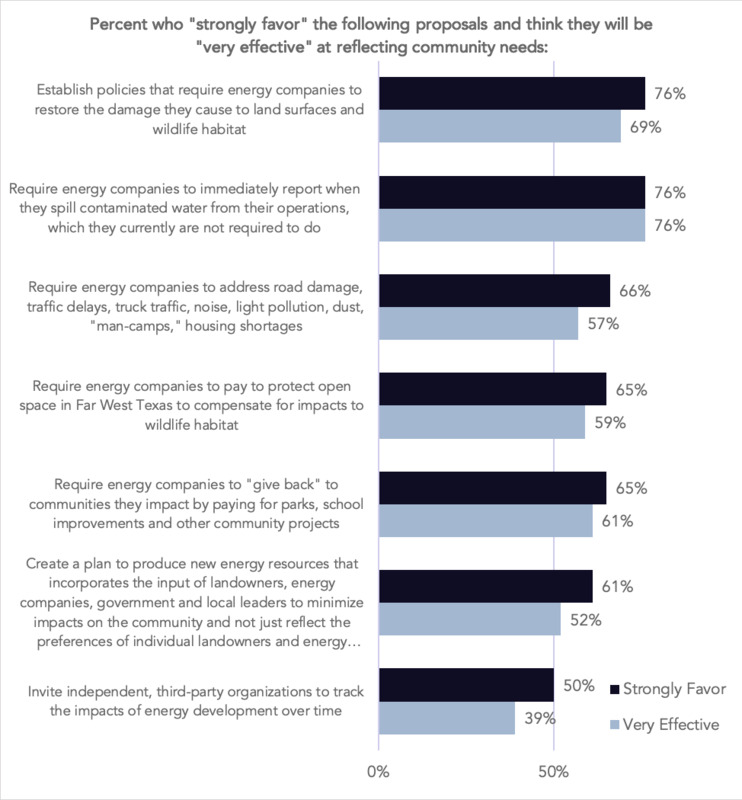 Note that survey respondents weren’t opposed to energy development everywhere. They were supportive of it happening in places such as the Gulf of Mexico (57 percent) and the Texas Coastline (50 percent). Some of the concern about protecting “special” places may be due to the fact that few Texans have complete confidence that oil and natural gas can be developed with minimal impact. The energy companies who would be doing the work are not seen as especially credible either. What do Texans want when it comes to energy development? Regardless of the issue we’re talking about, there is no doubt that people want their voices to be heard. The data showed that Texans overwhelmingly think their fellow residents should have a greater say about what happens in their communities. Increasing reporting requirements when it comes to water contamination. This reflects the concerns about water issues that arose spontaneously in our focus groups. Restoring land to its original state. Energy development is as much a part of Texas culture as football in the fall, but voters’ trust in energy developers only goes so far. Voters lack confidence that developers can extract oil and gas resources while protecting the communities, land, and water, particularly when it comes to places such as the greater Big Bend region. They’re adamant that the right safeguards are in place to protect Texas natural resources and ensure that energy companies restore the land and wildlife habitats to their natural state. The findings in this study are based on a telephone survey of 1,203 registered voters living in Texas. The survey included a representative sample of 1,002 voters and a targeted oversample of 201 voters living in far West Texas—specifically, Brewster, Culberson, Jeff Davis, Pecos, Presidio, Reeves and Terrell counties. Interviews were conducted between February 21 and March 26, 2018 and averaged 28 minutes in length. Amber N. Ott and David V. Iannelli are founding partners of Hudson Pacific, a data-driven public affairs consulting firm. Hudson Pacific studies public attitudes, using opinion research and behavioral analysis, and use the insights they gather to help companies and organizations design effective communications and public engagement strategies.